We offer a high quality range of Mechanical Conveying System which ensures high degree of quality. They are used in various applications in many industries and well known for their longer service life and robust construction. Our ranges of these conveying systems are checked on various parameters like durability, high resistance power and tolerance by our quality analyst so that defect free range is supplied to the customer. Clients can avail these in different sizes, shapes and as per their own specifications at affordable prices. Our range of mechanical conveying system suits items like bucket elevators, belt conveyors, pneumatic conveyors, screw conveyors, silos bagging, and packing sections. This system has been precision engineered by our highly skilled technicians for complete accuracy and performance. Our esteemed clients can avail these products from us at market leading prices. 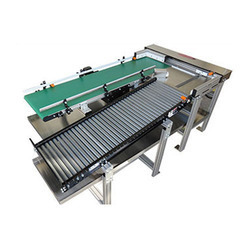 Looking for Mechanical Conveying System ?